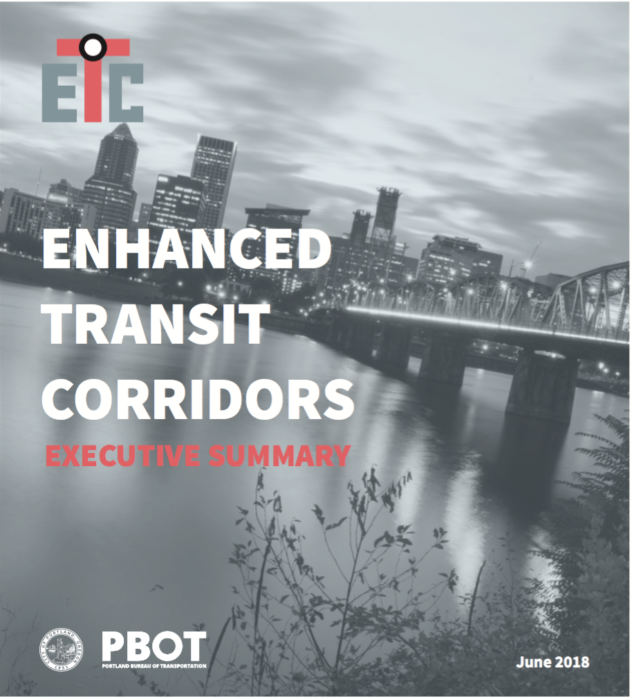 The Portland Bureau of Transportation has released the long-awaited Enhanced Transit Corridors plan, a set of policies and strategies to increase the speed and reliability of Portland’s major bus lines. As in many cities, Portland’s bus lines have been slowing down about 1% a year, which is slowly eating away at people’s access to all kinds of opportunity. The plan also points the way for the City of Portland to be a more active leader in transit policy, much as the City of Seattle has done so effectively. 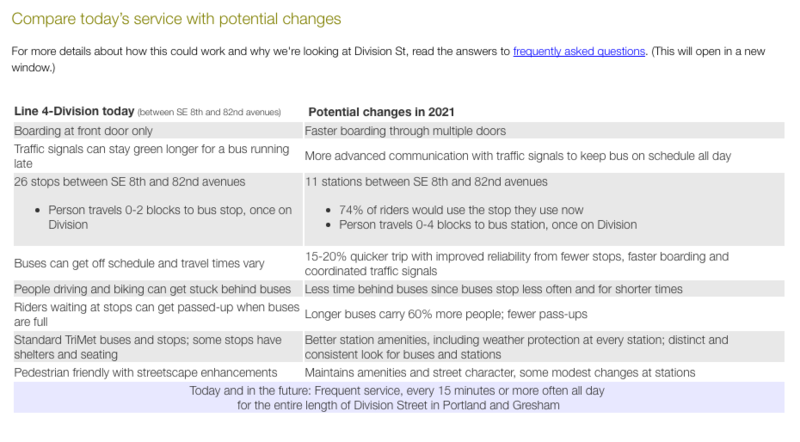 The Portland Bureau of Transportation invited me to draft the Executive Summary, which offers some examples of ways to make this topic urgent for more people. I’m happy with how it came out, and people fighting similar battles in other cities may find it useful. Here’s the Executive Summary. Here’s the rest of the report. Portland residents: Have your say at or before the City Council hearing on June 20 at 2 pm, in the Council Chambers. You can also submit comments before June 20 by writing to cctestimony at portlandoregon dot gov, cc: etcplan at portlandoregon dot gov. It would be great if our City Council heard, loud and clear, how important this effort is. In most US cities, the city doesn’t control the transit agency, but it does make huge decisions that largely govern whether transit can succeed. Cities control land use planning, which determines the number of people and jobs that are in places where transit can compete for them, and they control street design, which has a powerful impact on whether buses can operate reliably. Other city functions, like parking and law enforcement, also have a big impact. So we get great outcomes only when city government takes a strong leadership role on transit, partnering with the transit agency but also leading in the areas that it controls. Two new plans out of the Portland Bureau of Transportation show the City of Portland rising to that challenge: the Enhanced Transit Corridors Plan, now in public comment, and the Central City in Motion plan, which is just beginning. While the city has nice transit priority policies and has done a few bus lanes before, we’re now seeing an effort to think more systematically about how to get buses moving again. As traffic grows, speeds fall just gradually enough that the problem never makes the headlines, but a decade of this adds up to a major loss of access to jobs and opportunity. We’re seeing this rate of drop — around 1% a year — in many growing cities we work in. This chart shows the city’s busiest frequent bus lines, which collectively add up to a huge share of the transit ridership. Losing about 10% over a decade doesn’t just mean that people’s trips are longer, but also that 10% more buses must be deployed to maintain the same frequency, consuming funds that could otherwise be spent on growing the network. Many of the most critical problems are around the edges of downtown, where many routes converge on chokepoints — most commonly the bridges — that are also places where traffic converges. The Center City in Motion plan is where those problems will be addressed in detail. There’s also a chance to rethink the role of parallel streets to reduce conflicts between different modes. This is a big change for Portland. Too often in the past, the city has plan different modes in isolation — the bike network here, the freight network there, a streetcar plan here, the transit agency’s plans over there — when the best solutions arise only from thinking about all the modes together and how they can best share a limited transportation network. I’ve worked on studies that do this, in Seattle and Minneapolis, and it’s great to see Portland finally insisting on this kind of thinking. Proper transit priority on approach to all of the congested bridges, and between the bridges and the transit mall. Integrated planning of bike and transit to reduce bike-transit conflicts. Reviewing all the east-west transit routings in downtown, possibly consolidating them onto fewer streets. Making better use of the Transit Mall for buses. At this point I wonder if too many routes have been removed from it and we are not getting enough value from our premiere transit priority facility. Fixing the unacceptable 5-block separation of the two directions of Line 15-Belmont/23rd downtown. If you live in Portland, get on the mailing list and share your own views! On November 8 I was the guest of the Board of Directors of the Portland area transit agency, TriMet, for a two hour workshop on issues facing the agency. It was not so much a presentation as a freewheeling discussion, where Board members got to engage with me, question some of my ideas, and sharpen their own views. I rarely have a chance to engage with transit planning in my own home town, so I was really honored by this opportunity. Most of you have much better things to do than listen to two hours of this, but for those special folks who love these things, it’s here. There’s some cool new philosophical stuff at the beginning. My part runs 0:24:26 to 2:28:30. There’s some further relevant Board/staff discussion, about where to go with the agency at 3:50. Portland — where I grew up, and where I live again now — isn’t used to being attacked, but I’m proud of how many there are responding. The terror attack on our light rail system, in which two men were killed and another injured for trying to stop the abuse of Muslim passengers, has been understood as an attack on the city itself. If citizens cannot accommodate the ways they are different from one another, a democratic city is impossible. Diversity — and the principle of kindness toward people who are different from you — is as essential to our city’s functioning as a water supply is. So attacks on diversity are as much of a threat as attacks on our water supply. Public transit, in particular, is always under attack, in part because of the levels of mutual respect that it requires. No moment in urban life requires such intimate contact with diversity as the time spent on transit. You are closer than you might like to people who are different from you, and unlike on the street, you can’t just walk away. Sharing space on a bus or train requires 100 little adjustments, tiny acts of respect or accommodation. Not everyone can do this. So for those trained to read diversity as danger, hatred of public transit is understandable. The healthiest response to this kind of attack, I think, is to take it personally, as most Portlanders I know are doing. We should understand that the hatred is directed at each of us. This is moral outrage that resonates through at least three tiers of concern: It’s an attack on our own values as individuals, and also on our city, and also on the whole idea of civilization. Feel how similar those three ways of being offended really are. Then respond with an outrage that remains fused with kindness for one another. For that is the whole point. 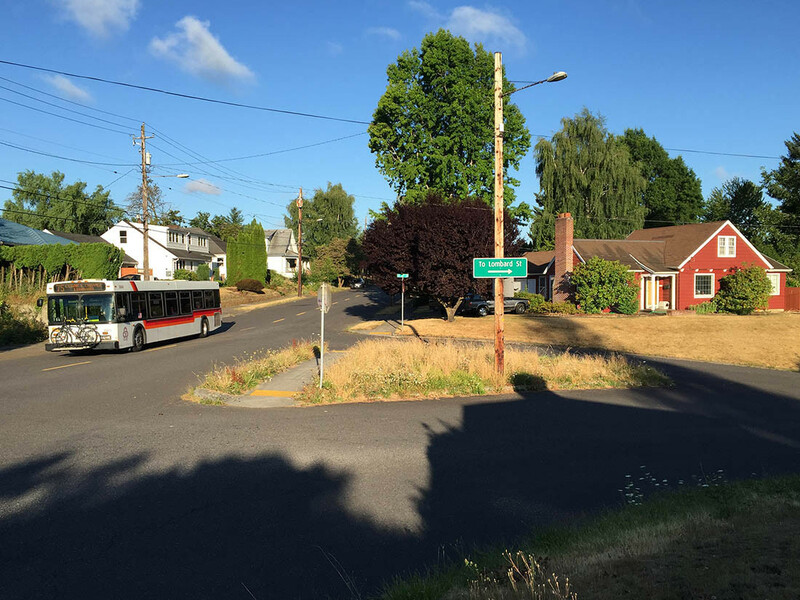 For the past few years, planners at the transit agency TriMet and MPO Metro in Portland have been carefully shepherding the development of a new sort of transit project for the city. It’s turning into a new sort of transit project, period — one that doesn’t fit in the usual categories and that we will need a new word for. The Powell-Division Transit and Development Project extends from downtown across Portland’s dense inner east side and then onward into “inner ring suburb” fabric of East Portland — now generally the lowest-income part of the region– ending at the edge city of Gresham. It was initially conceived as a Bus Rapid Transit (BRT) line, though one without much exclusive lane. It would be a new east-west rapid element in Portland’s high-frequency grid, and also serves a community college and several commercial districts. (Full disclosure: JWA assisted with a single workshop on this project back in 2015, but we haven’t been involved in over a year.). Below is a map of how the project had evolved by 2015, with several routing choices still undetermined. From downtown it was to cross the new Tilikum bridge and follow Powell Blvd. for a while Ironically, as inner eastside Portland began to be rethought for pedestrians and bicycles, decades ago, Powell was always the street that would “still be for cars.” To find most of the area’s gas stations and drive-through fast food, head for Powell. As a result, it’s the fastest and widest of the streets remaining, but correspondingly the least pleasant for pedestrians. Because dense, road-dieted Division is very slow close to the city but wide and busy further out, the project began out with the idea of using Powell close-in and then transitioning to Division further out, as Division got wider, though of course this missed the densest part of Division, which is closest-in. However, very little of the corridor would be separated from traffic. While this project was never conceived as rail-replicating, it was based on the premise that a limited-stop service using higher-capacity vehicles, aided by careful signal and queue jump interventions, could effect a meaningful travel time savings along the corridor, compared to trips made today on TriMet’s frequent 4-Division. That line runs the entire length of Division and is one of the agency’s most productive lines, but it struggles with speed and reliability. As it turned out, though, the travel time analyses showed that from outer Division to downtown, the circuitous routing via Powell cancelled out any travel time savings from faster operations or more widely spaced stops. The new plan is basically just stop consolidation with some aesthetic and fare collection/boarding improvements. But the stop consolidation would be dramatic. Note that one numbered avenue in Portland represents about 300 feet of distance, so the new spacing opens up gaps of up to 2400 feet. If you’re at 30th, for example, you’d be almost 1/4 mile from the nearest stop. Such a plan would be controversial but quite also historic. It’s a very wide spacing for the sole service on a street. On the other hand, the wide spacing occurs on a street that is very, very walkable — one of the city’s most successful “mainstreets” in fact. And it’s basically the only way to optimize both speed and frequency on a two-lane mainstreet like inner Division. At this point, it would be strange to call this project “BRT” (Bus Rapid Transit); even the project webpage refers to this alternative as “Division rapid bus”. Disappointing as this will be to those who think BRT should emulate rail, it has one huge advantage over light rail. In Portland, surface light rail tends to get built where there’s room instead of where existing neighborhoods are, so it routinely ends up in ravines next to freeways, a long walk from anything. This Division project now looks like the answer to a more interesting question: What is the fastest, most reliable, most attractive service that can penetrate our densest neighborhoods, bringing great transit to the heart of where it’s most needed? This is such a good question that we shouldn’t let arguments about the definition of “BRT” distract from it. Because it’s not a question about technology. It’s a question about people. Upgrading the 4-Division to a rapid bus line (without underlying local service, which is impossible due to the constrained roadway) should present a real improvement in quality of service (in terms of capacity using the larger vehicles, and in a 20-25% travel time savings), while at the same time being easier to implement and less disruptive to existing travel patterns. It also provides a template for TriMet to consider stop consolidation and frequent rapid service on other corridors like the aforementioned Line 72. Rather than seeing this as a failure to design a rapid transit project, perhaps we can celebrate a process that has steered away from a path that would have resulted in a disappointing outcome, towards a more limited, more economical, but still meaningful improvement for riders. Portland-based photographer Geoffrey Hiller is best known for a marvelous book Daybreak in Myanmar, which interleaves pre- and post-revolution images of that country. 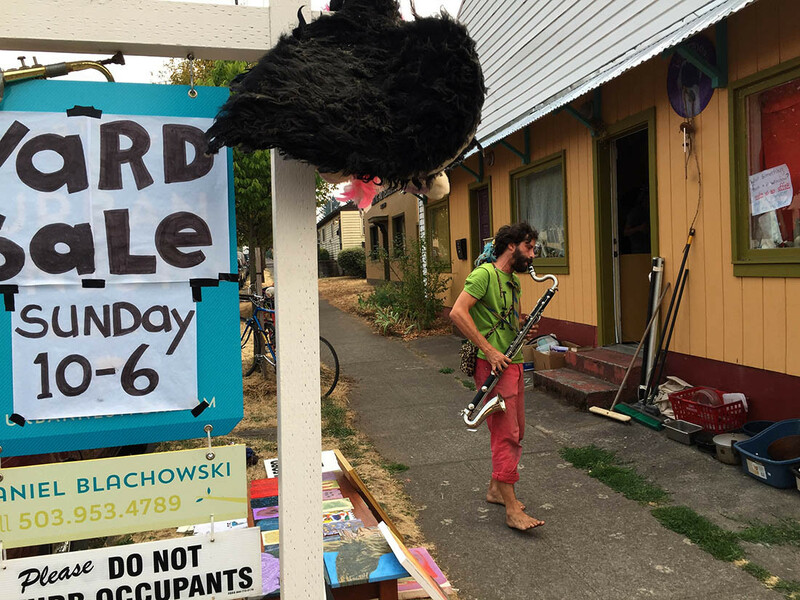 Now he’s turned his attention to one of Portland’s most interesting bus lines — at least in terms of the diversity of unsung corners of the city that it serves, and the beautiful and often eccentric people who live and do business there. His blog lays out the work in little photo vignettes with commentary. It’s wonderful. As it makes its long orbit around Portland, then, the 75 tours the shifting front lines of many epic struggles. Gentrification loves the bohemian but chases it away. Defenders of history scream “stop demolishing Portland!” even as a desperate need for housing calls for bigger buildings. And in parallel, everywhere on the 75, you can watch the parallel dramas of power and weakness: power struggling to protect itself, while others struggle for survival and dignity. To this shifting landscape, Geoffrey Hiller is the perfect guide. He knows you’ve seen the real estate photos, the chamber of commerce photos, the tourist photos, and the photos of cashed-up millennials in designer grunge luxuriating in sculpted authenticity. He wants you to see something else. Here is the Portland in between things, the struggling and hopeful Portland, the Portland that’s happening anyway despite everyone’s grandest plans. You might find it a useful accompaniment to Geoff’s photos. It’s all about a Portland you may have missed in your perusing of real estate magazines, or for that matter your urbanist-guided tour. Is Infrastructure Still about “Awe”? [Dave] Eggers’s proclamation that the Golden Gate [Bridge] is beloved because it’s outrageous and weird may fly in the face of just about everyone’s attitude about infrastructure, but it also gets at exactly what we should be feeling about bridges and tunnels. American infrastructure is deferred home maintenance on a massive scale. We just keep putting it off until something major — and often catastrophic — happens, and then it ends up costing twice as much as it would have had we taken care of it proactively. This is a bad strategy — yet it’s the strategy that seems to define United States infrastructure. There is no awe. There are issues of structural integrity. There are mind-blowing cost overruns. Accidents. Sinkholes. Problems with bolts. The first design proposed for the Golden Gate was, writes Eggers, “the strangest, most awkward and plain old ugly bridge anyone had every seen … people compared it to an upside-down rat trap.” (Here is what it looked like.) The public demanded something better — and they got it. 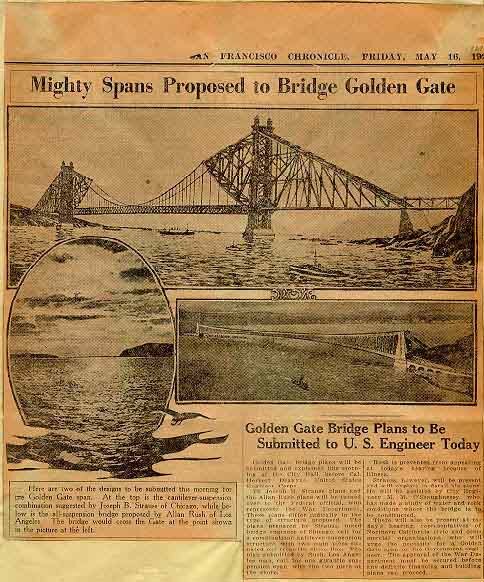 A century later, we’ve lost our collective faith in the power of great projects like the Golden Gate, not to mention our trust in the government to fix a pothole on time and on budget, let alone create an inspiring bridge. How can we restore that faith in possibility? I’ve lived in cities with awe-inspiring infrastructure (San Francisco, Sydney, Vancouver, Paris) but now I’m based back in my original hometown, Portland. And Portland is the perfect riposte to Arieff’s obsession with awe. Portland is “awesome” but not the least bit awe-inspiring. If you want to gape at the spiritual grandeur of human works, strike us off your list. Our monuments, bridges, and major buildings are all modest and even gentle. Many are beautiful but none are magnificent. Our city is so human-scale that we just don’t need to build very big things. For some related reason, we also have no need for a dramatic, soaring tower with a rotating restaurant and observation deck. We don’t need the tower, because we have hills and mountains. Portland manifests a particular reaction to a natural setting: not the desire to compete with it by creating infrastructure of comparable grandeur, but a humility toward it, a happiness that comes from dwelling in its shadow, and letting it give us all the awe we may need. Nature now awes us in another respect: We’ve been warned to expect an appalling earthquake in which thousands of us would probably die, because our infrastructure isn’t designed to survive it. Of our 12 river bridges, for example, only the newest one is pretty assured of not collapsing (a second is now under construction.) Countless brick and concrete buildings and highway ramps are likely to go. Arieff dismisses the small mindedness of “problems with bolts,” but bolts are exactly what’s going to kill us. Telling Portland to spend money on awe instead of bolts could be a pretty direct threat to our lives. The bigger lesson of Portland is you can build a great city by learning to take pleasure in the actual functioning of things, and the resulting liberty and happiness of people. Pioneer Courthouse Square, for example, is pleasant but not awe-inspiring, and the real reason to love it is that it’s so massively useful for all kinds of happy and liberating purposes. In our better moments, we feel that way about our transit system. Function, especially when it engenders liberty and opportunity as functional transit does, can be a higher delight than awe, and a more durable one. The other problem with awe is that it’s so often about the power of some people over others. Versailles and Imperial Vienna are awe-inspiring, but the awe has a purpose: to make you accept your place in a hierarchy of power and privilege. The medieval cathedral was a gathering place (like our civic squares) and an honest monument to human spirituality, but the awe you feel there is also meant to make you defer to the authority of your local priest and the Pope. Awe and intimidation are the same thing in slightly different light. So perhaps we should be suspicious of awe, with its reverberations of power and grandiosity. Delight and pleasure are are better aesthetic selling points, but at our best, as in Portland in its better moments, even these things arise from functionality, safety, usefulness to vast spectra of people. And the infrastructure that best does all those things may not be awe-inspiring, in the same way that Portland isn’t. Let us create affordable and inclusive delight wherever we can find it, but let’s be sure that advocates of function are in the room, reminding us of the urgent human rights and ambitions that only functional infrastructure can support. Appeals to awe, in particular, are not how we build that room. Historically, awe’s purpose has mostly been the opposite: to keep people outside, mouths agape at the magnificence, while their betters plan their destiny. Evan Landman is an associate at my firm, Jarrett Walker & Associates, and serves as a research assistant and ghostwriter on this blog. He tweets on transit and other Portland topics at @evanlandman. For years on this blog and in our projects, we've stressed the importance of highlighting and emphasizing transit agencies' Frequent Networks on customer information of all kinds. Portland's agency TriMet has traditionally been a best practice example here, given their extensive Frequent Network branding down to the individual stop level, but curiously, their system map has not embraced this idea so wholeheartedly. Today, TriMet's new system map changes that, introducing a cleaner, more readable map, which does a much better job of highlighting the agency's premier bus services. This Southeast Portland shows the core of the city's Frequent Network. The Frequent Network is symbolized with a thicker line weight, but every line still has its own individual color, presumably to make it easier to trace each individual line across the network. However, the effect of this choice distracts from the important information contained in the line weight property, because the wide diversity of bright colors climbs to the top of the visual hierarchy, though the colors communicate nothing about the nature of the service on each line. The legibility of the map is not aided by the large number of points of interest shown, with both text and symbols frequent overlapping the most important features (the transit routes). TriMet's old map was certainly not a bad transit map by any means, and deserves enormous credit for being one of the first to explicitly show frequency at all, but in the years since, many of TriMet's peer agencies around the country have focused even more heavily on frequency to produce truly useful and innovative maps. This is a map that truly focuses on communicating the usefulness of the transit routes. The most important factor for usefulness is frequency, which is obscured when every line on the map is the same color, or a different color, or colored by a less important attribute, like which corner of the city it serves. Here, weight and color are both deployed to differentiate the Frequent Network (heavy, dark blue) from other less frequent routes, but without the riot of color of the older map. When we compare the legends of each, the difference is subtle, but the when deployed on the map, the difference is dramatic. This new map makes one thing very apparent: anywhere near a thick, dark blue line, a bus is always coming soon. It is also a clearer, more traceable map! Where the old version employed the common convention of using color to distinguish routes and make it easy to tell where they travel across the city, the new map uses line displacement and simplification in a much more sophisticated manner to accomplish the same task. For example, examine the path of the 10-Harold: on the old map, its line appears to end at Hawthorne and 12th, where it joins the 14-Hawthorne to head into downtown (it's actually beneath the 14's line, if you look closely). With the new map, it is much clearer that this route overlaps with the 14 in this segment, just by the way in which the two lines have been separated from one another. Now that color is now longer necessary to distinguish each route, it can be used for a more important purpose: showing frequency. Apart from the increased focus on frequency, this map also succeeds by reducing the amount of non-transit information, with fewer points of interest labeled. Those that are present have symbols and labels drawn with a brown color much closer to that of the map's background, reducing the effect of collisions with transit features, and diminishing the level of visual "noise" competing with the transit network structure for the reader's attention. It's fantastic to see an agency like TriMet continuing to work to improve its customer information. Even in the age of real-time data and mobile trip planning, a transit agency's map is often the only place where the entire system is documented in a way that an average person can understand. City transit networks are complex, and the best maps, like TriMet's, are designed to reduce that complexity, focusing on the most important aspects of the service for the people who ride it. … especially if you're into architecture, urbanism, philosophy, or literature. It's from a keynote to the Oregon Transportation Summit, sponsored by TREC at Portland State University last year. There are a few local Portland geography references, but nothing you can't follow … Great questions too. This is a year's trend comparing bus and light rail (MAX) service in Portland's transit agency, TriMet, from the performance dashboard at the TriMet Transparency and Accountability Center webpage. The metric here is operating cost per boarding ride. This is a good overall measure of how effectively a transit agency is liberating and moving people, where down means good. (I prefer this ratio upside down: ridership per unit cost or "bang for buck," so that up means good. but this is obviously a chart by finance people who always want cost on top.) This is a "macro" metric. Practically everything a transit agency does affects it, so it's lousy diagnosis but not bad if you only have bandwidth to convey one measure. Most American transit data just compares bus and rail, and inevitably shows bus performing worse. You'll see that here too if you just look at the wide solid lines. From this we get endless ignorant journalism lamenting the poor performance of the city bus, as though all city buses are basically alike. What if we separated out highly useful and liberating bus service as a separate category? That isn't exactly the distinction made here but it's close. TriMet's Frequent Service network (still being restored, but mostly now back in existence) is the network of all services that are almost always coming soon. Frequent bus performance is now very close to light rail performance. 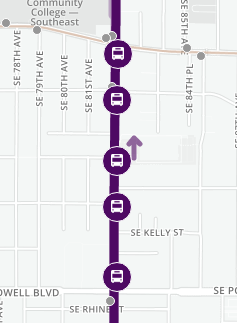 The spread between Frequent Bus and infrequent bus is usually bigger than the spread between all buses and light rail. The lesson is pretty clear: The "city bus" is a misleading category, and the much-fetishized difference between bus and rail may matter less than whether the services are designed to be useful. And when it comes to usefulness, no one variable capture that more than frequency.